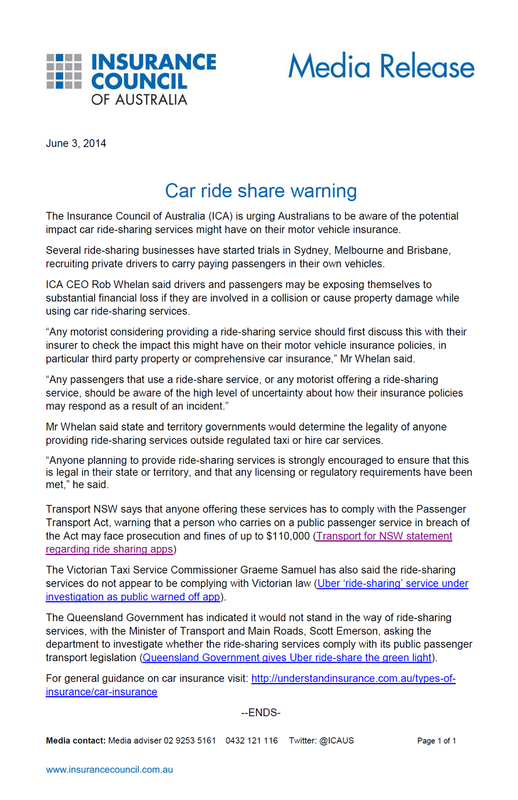 Insurance Council of Australia has mislead consumers into thinking Ridesharing is illegal or have they? It was a letter to advise consumers to make sure that they check their insurance before driving in a rideshare, and we totally agree. Not all insurance will cover you for rideshare / carpooling. What this article also did do was cause confusion with consumers as the article also advised that ridesharing was illegal in some states. This is largely untrue, ridesharing is legal and has been for a long time. My response to the Insurance Council of Australia has been..
"I understand the measures of warning consumers to check their insurance first, however actual Carpooling / Ridesharing is legal and has been for many years. The definition of Ridesharing is taking friends, family work collegues etc in your vehicle or Even using a Rideshare site such that im driving to byron bay and have 2 seats available. As long as there is no profit to be made on and the costs are shared this is legal. What UBER and Lyft call Ridesharing is not actually ridesharing, they are nothing but illegal taxi services labelled as something else. I believe you should be publishing an article to correct and make clear that Carpooling/Ridesharing is legal and what is in question is UBERs version of Ridesharing.	" We received the following response from Ben at Insurance Council of Australia. Thank you Ben for setting the record straight here. Please note the term "ride hailing services" has generally been used. The ICA has been specific in its guidance that the industry is concerned about quasi-taxi services. However, regulators, the media and governments are using the term "ride sharing". You may wish to take your argument up with these organisations. The ICA has never suggested car pooling is illegal.